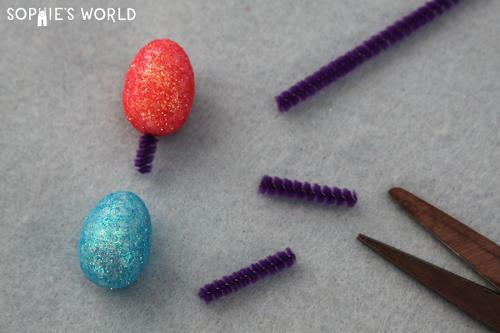 Dollar Store Crafts: Easter Egg Insects! I’m obsessed with my local Dollar Tree store! Although there are 3 branches within 10 miles of my office, there is one directly on my drive to work. It opens at 8:00 AM which means I can shop there and still be in my office by 8:45. This is both a blessing and a curse, as I’m sure I spend way more money then I should. But the crafting inspiration I receive when I walk through those sliding doors is invaluable. The other day I noticed a brand new display of foam easter eggs. Right now my local store has packages of 6 3-inch eggs and 12 2-inch eggs. The eggs are white and made of the kind of smooth styrofoam that can be painted and colored. Unlike the more common grainy styrofoam this makes them perfect for art projects. 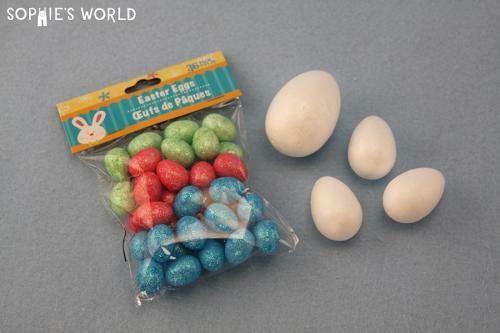 They also have little bags of 1-inch glittery eggs in assorted colors, 36 per bag. The minute I saw the display my mind started racing - to bugs. I know, Easter would have been the logical jump. But to my eye, the egg shapes lend themselves beautifully to the heads and thoraxes of bugs! I immediately stocked up, because if you shop frequently at dollar stores you know that their seasonal items come and go. And when they go, they are gone...often for a year! 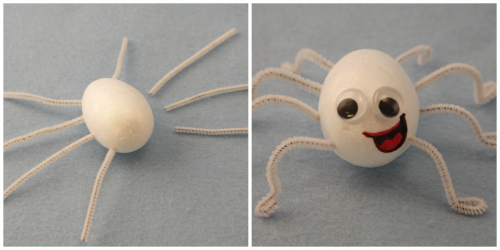 As you will see, it doesn’t take much to make a foam egg into a fabulous critter! All you need are pipe cleaners (or bread bag ties), markers or paint, paper, glue, and google eyes. To join the body parts simply use one inch pieces of pipe cleaner. You can use longer pieces if you want to leave the pipe cleaners exposed. Insert the pipe cleaner in one side of one egg and the other half in the second egg. Gently push the two eggs together to secure. If you wish, you can add a drop of glue on the ends of the pipe cleaners, but it’s not necessary. 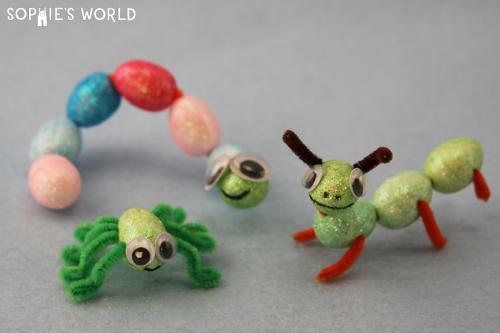 Use additional pipe cleaners for legs, antennae, tongues, whatever you like. 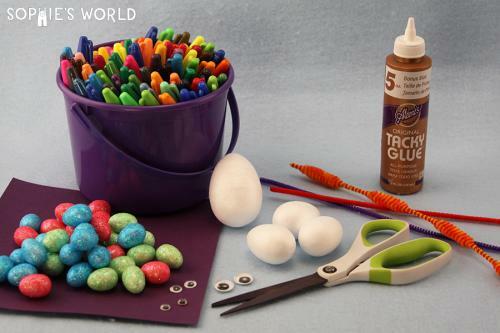 Simply cut to length and insert one end into the foam egg. 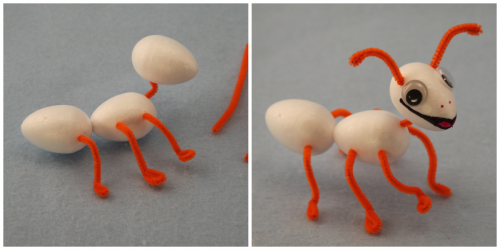 You can roll the exposed ends of the pipecleaner around a pencil to get a curved effect for the feet or feelers. Add details with markers or use glue to add eyes. If you wish to use hot glue - place the glue on the item you wish to attach, count to 10, and then place on the styrofoam. This will keep the foam from melting. 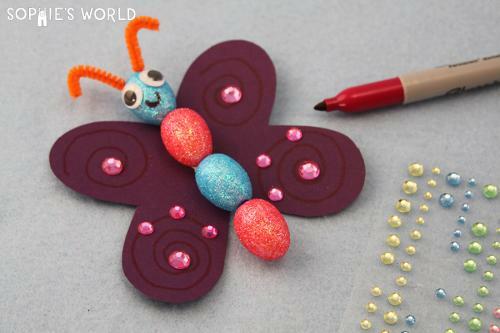 If you wish to make a butterfly - make your body first, then cut out a pair of wings from paper and glue the body onto the wings. You can get creative here by making all sorts of combinations and adding other materials into the mix. 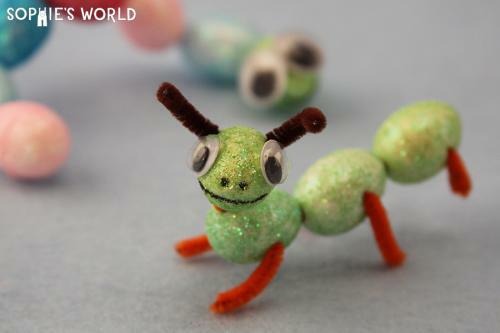 One of the reasons I love this sort of project, is that even little hands can create a fabulous creature. The nature of the foam is very forgiving, and easy to work with. Even if a child just sticks lots of items into an egg, it turns out beautifully. The best thing is that this shape lends itself to so many projects - bugs and easter eggs are just the beginning! If you’ve got a local Dollar Tree I suggest making a run in the next week or so, before Easter has come and gone. That way you can tuck your little eggs away for future projects. And stay tuned...I foresee more dollar store crafts in my future!